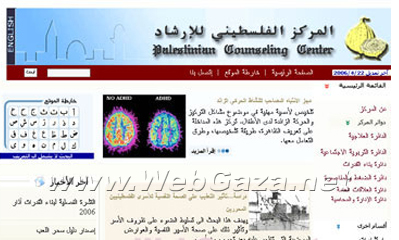 Palestinian Counseling Center - What is Palestinian Counseling Center? The Palestinian Counseling Center was established in Jerusalem by a group of psychologists, sociologists, and educational experts in 1983. The Center was established to work on developing and improving mental health concepts and services in Palestine. Work at the Center started out on a voluntary basis through raising awareness in school to the importance of counseling and the importance of working with children exposed to physical and political violence. At that time, mental health services were restricted to psychiatric treatment for mental disorders at mental health hospitals such as the hospital in Bethlehem, in addition to private clinics that were operated by psychiatrists. Treatment methods used were limited to bio-medical treatment, i.e., medication and electric shocks as well as behavioral therapy. Since then, the Center has passed through a number of phases in its development process that led to the present shape and character the Center is in today. Since the establishment of the PCC in 1983, the Center's vision has remained the same, and that is, to have a healthy Palestinian society that is productive in an independent Palestinian state with Jerusalem as its capital. This vision focuses on building the balance between the individual and her/his surrounding environment. In order to reach this vision, counseling as a concept had to be introduced, understood, and accepted in Palestinian society. Since its establishment in 1983, it was very important for the Center to maintain a clear ideological approach that ran parallel to our work undertaken with the individual and community from a mental health perspective. Our vision is that the individual is a unit or an entity in the bigger social context. This unit is crucial in composing the big social structure, and therefore if this unit or cell is healthy, then the bigger structure that is the society, will not suffer and deteriorate, but will become strong and flourish. We view the individual holistically. This inevitably means that services we provide cater to the individual, 'the Self', with all her/his needs and as a complex social being. However, our main concern, was in, 'the Self' as the main point that inspired our thinking and holistic service provision. The PCC as present is the result of a cycle of transformatory phases that shaped it the way it is today. The PCC started intervening at the primary intervention level concentrating its efforts in raising the community's awareness to the importance of counseling as a form of effective therapy for various psycho-social problems. The PCC then moved to intervene at he secondary level by placing supervising psychologists, counselors and social workers in schools and primary health care clinics. In the period that followed, it had become acceptable and even requested that specialized mental health clinics exist and operate.